Find out what our experts have to say about Mahindra Mojo! While most manufacturer gradually increase the displacement of their bikes, Mahindra leapfrogged from a 110cc to a 300cc in the form of the Mojo. After much delay, the Mojo was finally launched and positioned as a tourer bike. 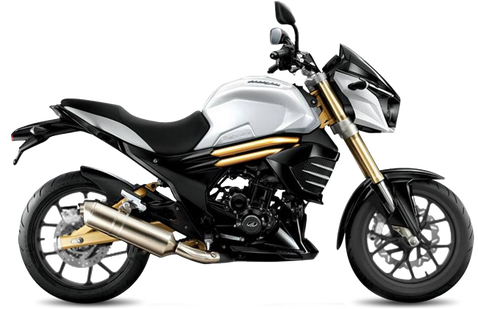 It has a refined engine and supple ride quality making it a good machine for touring. But the high kerb weight and its front heavy nature makes it a handful to ride in city traffic. Choose the Mahindra Mojo which fits your bill! Choose the Mahindra Mojo which fits the bill of you. Mahindra Mojo is the latest addition to the list of Rs. <2 lakh bike segment, designed for munching miles on highways. It's also Mahindra's first attempt at the premium touring motorcycle class. The design is quite beefy and unlike anything in the market right now. But it still looks like a typical Mahindra with those golden ribs around the radiator. The same shade has been applied on to the upside-down (USD) front suspension and swingarm as well. If you don't like the bling though, you can skip the black and white colours of the bike and opt for the red hue, where the gold on the ribs and swingarm is replaced with matte black paint. But, the USD forks still maintain their shine. The bike adorns twin headlamps with a double-barrel setup. Unlike other twin-pod setups, where one light is for high beam and the other for low beam, Mojo gets the ability to flash both lamps at all times. This gives it a symmetric appearance as both the bulbs can throw high and low beam. Although there are no projector headlamps, having two reflector units to light up the road somewhat makes up for the loss. The headlamps also get 8mm LED eyebrows, which make the front look very stylish. The bike gets slightly high set handlebars to make long distance riding comfortable. The 'Mojo' monikers on either side of the large 21 litre fuel tank are almost facing up rather than the sides. Speaking of the tank, its large capacity adds to touring credentials of the bike allowing for fewer top-ups on the way. Around the back, the bike flaunts 1x2 exhausts - one on each side, and these are bound to make your journey more musical. As with previous Mahindra two-wheelers, this one too manages to maintain NVH levels very well, keeping the handlebars vibe free for most of the rev range and making touring a pleasurable experience for the rider. The tail lamp cluster includes a reflector and a 12 LED piece stop lamp. The turn signals are still of the halogen type. Tubeless Pirelli Diablo Rosso II tyres belong to the super-grippy family, hugging the road very well while cornering. The only downside is that they are made of soft compound rubber and hence need to be replaced more often. The bike is powered by a single-cylinder, 295cc, liquid-cooled engine with Electronic Fuel Injection (EFI). This engine produces 27.2 PS of power at 8000 RPM and a very touring-friendly 30 Nm of torque at 5500 RPM. Stopping duties are performed by hydraulic disc brakes measuring 320mm in the front and 240mm at the back. Pirelli tyres are of the specification 110/70 R17 up front and 150/60 R17 at the rear.